Should spent fuel be stored at Yucca Mountain? 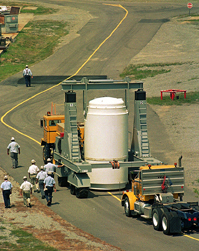 Thousands of tons of lethal nuclear waste from civilian power plants and military sites are stored at more than 100 sites around the country. But the federal government doesn't have a long-term plan today for managing nuclear waste. In the 1980s, Congress decided to build a single underground repository for spent fuel and highly radioactive defense waste in the southern Nevada desert. But work on the Yucca Mountain complex has faced political and technical problems and was canceled by President Obama, who advocates a new storage solution. Cancellation has created uncertainty for the nuclear power industry and for states where military waste is stored. It also is forcing utilities to pay to store used nuclear fuel at reactors — costs they pass on to customers. Some utilities have won multimillion-dollar lawsuits against the federal government, and more cases are pending. Obama supports expanding nuclear power as a clean energy strategy, but if the waste problem isn't solved, new reactors may be a hard sell in many states.